Christmas is just around the corner. You are probably thinking about possible gifts for the special woman in your life – whether wife, mother, daughter, or niece. 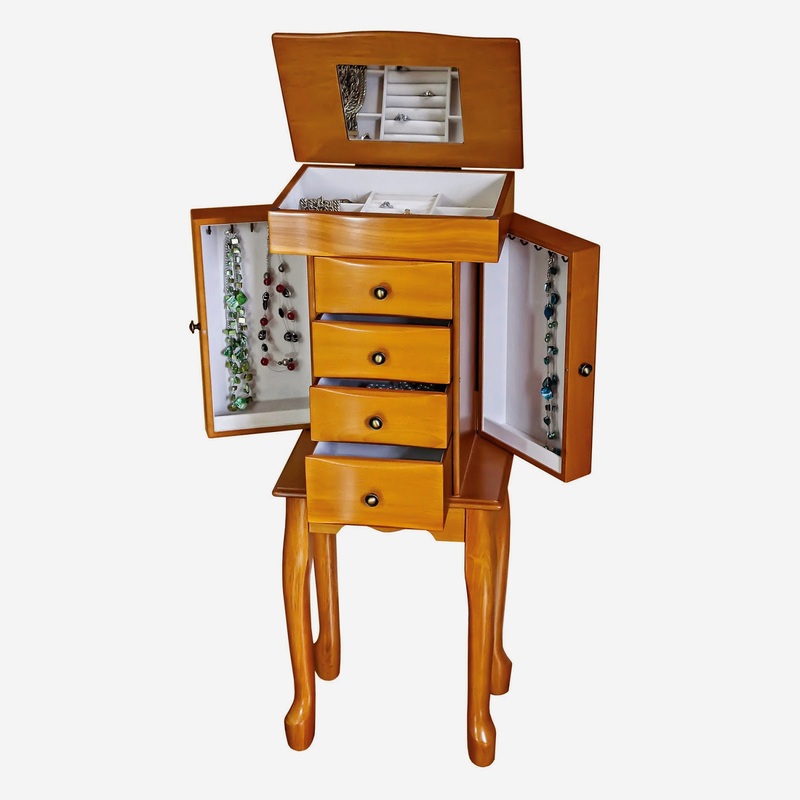 Consider a beautiful women’s jewelry box or jewelry armoire. These pieces make unique and beautiful gifts because they’re practical while making wonderful additions to her room’s decor. ChasingTreasure has a large assortment of jewelry boxes to accommodate any size jewelry collection, any décor style, and any budget. They are made from the most recognized manufacturers, making them well-constructed. And the designs, even contemporary ones, will still look appropriate across the decades, reminding them of the giver for years and even generations to come. Looking at the different options for jewelry armoires will help you decide which is right for the special woman in your life. 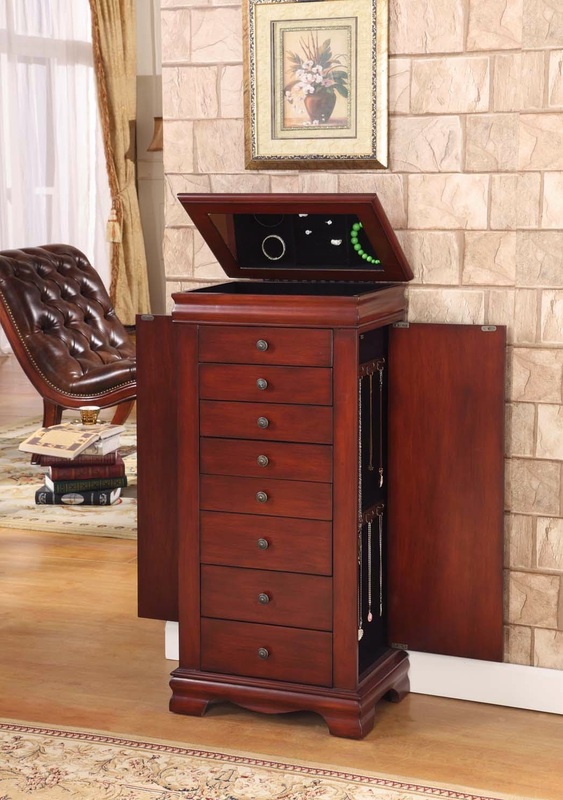 Jewelry armoires are wonderful gifts for women with a particularly large collection of jewelry and accessories, and the space to accommodate a dedicated piece of furniture. 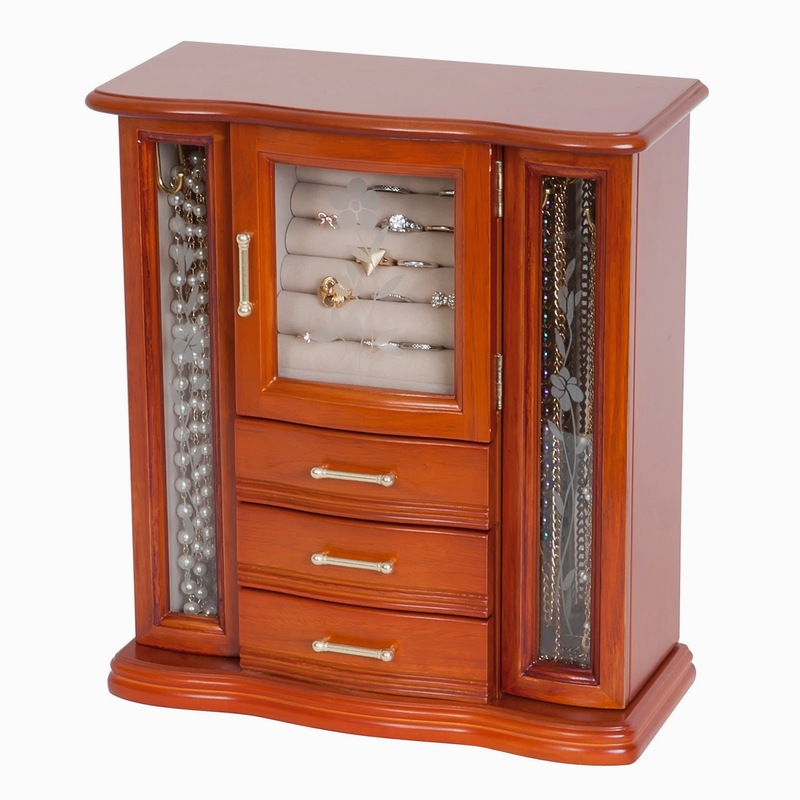 Jewelry armoires are larger than jewelry boxes and are freestanding pieces of furniture. These floor-standing cabinets are usually between 32” & 45” tall and include drawers and an opening top for smaller pieces like rings, as well as a large mirror. The drawers are lined and most include dividers for easy organizing. The sides are full-length swing-out necklace doors with hooks to let necklaces hang, preventing the necklaces from tangling and breaking. The bottom drawers are usually open and deeper, for bedside delicates. Her entire collection will be organized and the armoire itself will be an attractive addition to her room. Besides keeping her collection organized, a jewelry armoire with a locking enclosure can also keep her collection secure. Many of the jewelry armoires ChasingTreasure stocks are locking – giving her the peace of mind that her treasured heirlooms and favorite accessories are safe. Remember that when you gift a jewelry armoire from ChasingTreasure, you’re not only giving her a great way to organize her precious heirlooms and accessories: you’re also giving her a beautiful new piece of furniture: her personal style and décor will come into play when selecting a style of jewelry armoire. ChasingTreasure has many options for different types of woods, finishes, and styles. If the décor is traditional or understated, an oak jewelry armoire with traditional lines in a French provincial style would work well. Or, if she prefers antiques, a darker stain (such as a coffee finish) with antiqued brass hardware would fit in with her antique collection. If her décor is more exotic, an intricately detailed bamboo style armoire in cherrywood with carved columns and textured detail is perfect. If she prefers modern, sleek lines, a white or black armoire with carved diamond details on the façade and clean lines will fit well in her home. ChasingTreasure has the wood finishes, detailing, and hardware options to accommodate almost any bedroom style. When you choose a free-standing jewelry armoire, she is sure to be happy this Christmas knowing you took her tastes and needs into consideration. Another consideration is your budget, of course. ChasingTreasure offers a wide range of price points for both jewelry boxes and jewelry armoires. When visiting our site, you can find coupon codes on the checkout page to get additional discounts on our holiday pricing. We also have a 30-day return or exchange policy. There’s never been a more perfect time to get her a jewelry armoire: a thoughtful, practical, and beautiful gift! One of the considerations to make when purchasing a luxury jewelry box is the type of material used to make it. The predominant method the use of a material referred to as MDF, which stands for medium density fibreboard, which incorporates high grade, composite material with wood. The other method is to manufacture from solid wood. Why not always use solid wood, and how do I determine which to buy? I’m glad you asked! The main issue when using wood as a luxury, quality material is its longevity. Wood absorbs moisture (in fact, it needs moisture!) at different temperatures. This simply means that wood will bend and warp over time due to natural changes in temperature and humidity. As an aside, this is the original reason for painting wood, to seal in moisture and limit the negative effects of temperature and humidity. Composite materials that are combined with the wood have a lower density (more microscopic air pockets), which absorbs the contraction/expansion of wood under temperature and humidity changes in the air. This results in greater flexibility, making the jewelry box less susceptible to warping & bending. The advantage of this for a jewelry box is obvious: it is almost guaranteed to hold up over the decades. The use of ornate inlay, polished finishes, plush interiors, unique designs, and quality hardware, combined with the durability of MDF, is what gives MDF construction its luxurious qualities. MDF is used by top manufacturers because it is highly resistant to bending or warping, which means the jewelry box is likely to remain as beautiful in 30 years as it was the day it was made, with basic care of course! Most people view solid wood as the highest quality, and this is partially true. Top quality solid wood manufacturing is generally more expensive, this is due to the extra effort required to make quality wood furnishings from hardwood: greater emphasis on curing and sealing the wood, along with much tighter tolerances at the seams. The attraction of solid hardwoods is understandable, especially for luxury jewelry boxes. Solid hardwood construction leads to jewelry boxes that are much heavier, up to 30%, which implies higher quality and durability. Also, the wood can have beautiful patterns and individual attributes that makes the solid wood box completely unique, like a fingerprint. And, in the case of cherry, the beautiful smell is timeless and unmistakable. In conclusion, solid hardwood construction will always have the top appeal (and generally higher cost) for luxurious jewelry boxes, but don’t let this dissuade you from non-solid hardwoods: they are (practically) guaranteed to last, and will look just as beautiful, especially when inlaid with exotic woods like Bubinga! Wonderful Little Girls' Jewelry Boxes - Just in Time for Christmas! 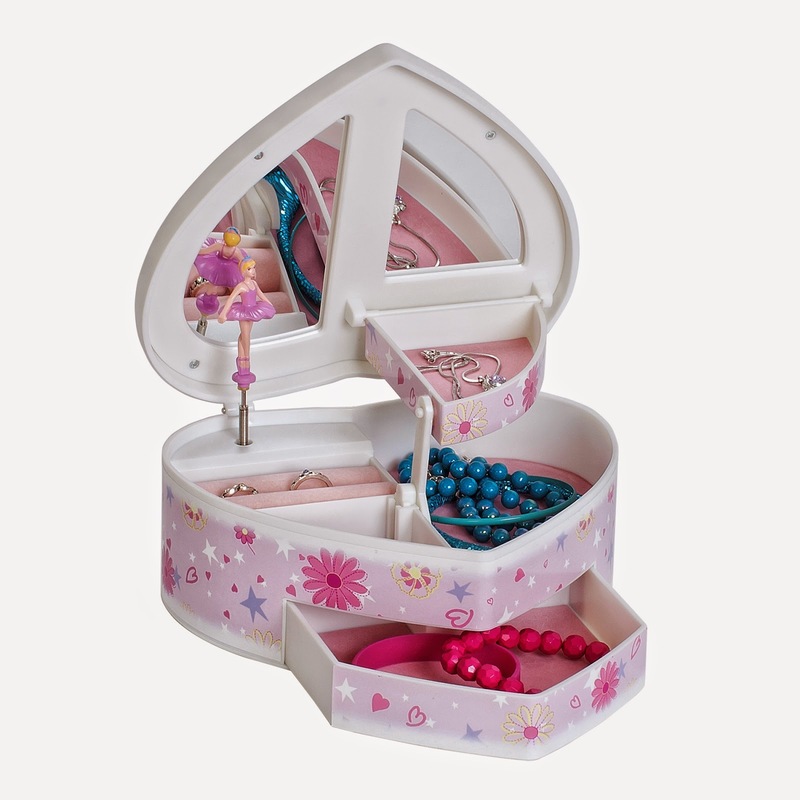 Little girls love owning a jewelry box – regardless of their other interests or hobbies! As they grow up, they appreciate being able to store their favorite treasures. And since many girls have their ears pierced at a young age, a jewelry box is the perfect gift to let them store and grow their own jewelry collection. And while many women upgrade to larger (and more luxurious) jewelry boxes as they move from early adult to marriage, they still keep their first girls jewelry box to pass down to their daughter, granddaughter, or niece. Historically, the pro-typical girl’s jewelry box was white with a pink interior. And many of the popular girl’s jewelry boxes featured a dancing ballerina on top accompanied by a traditional Christmas Carol or popular song. While that style is still sold, the times have changed, and little girls now have many more variations from which to choose. Even though the traditional girl’s jewelry box is still produced, there are newer styles to fit the uniqueness of your own beloved girl. Girls jewelry boxes not only differ in overall look, but they are made with a variety of materials, and have a wide choice of design/style, with many have special attributes that many little girls like, particularly to hide things from sneaky siblings! -Taller Girls Jewelry Boxes – These typically stand ~1 foot tall, and are taller than they are wide, in a tower style, which is ideal for a dresser or smaller night stand. These have combinations of pull out drawers (up to five), two swing out sides for necklaces, ring rolls for rings & earrings, and an open top lid with small mirror. This one looks most like Mom’s. 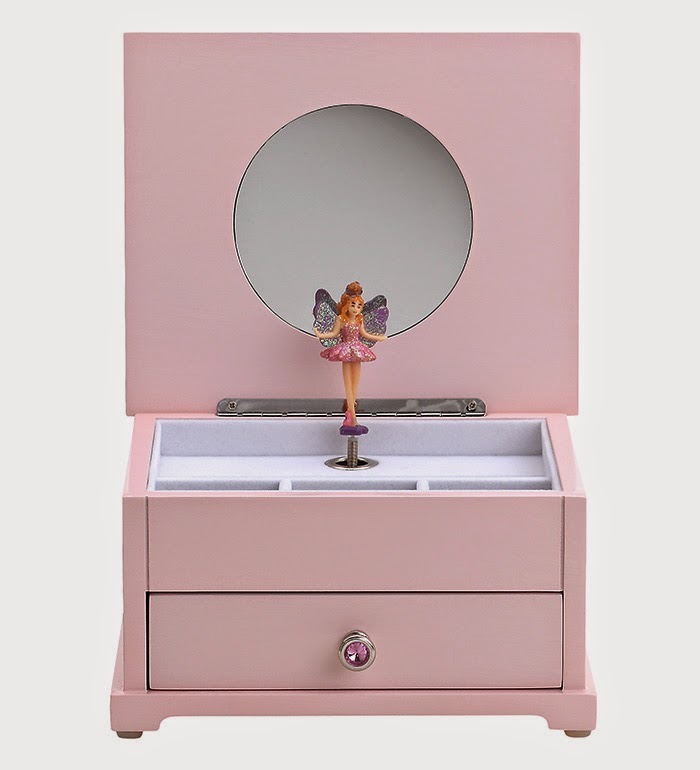 -Spinning Ballerina Jewelry Box – This features the spinning/dancing ballerina with accompanying musical tune that gained widespread popularity in the 1960s that continues into the 21st Century. Celine Dion’s “My Heart will Go On” is the modern song of choice, and “Swan Lake” by Tchaikovsky is the popular classic tune. Always popular! Adult women with large jewelry collections likely own standing jewelry armoire, and if you are a mother, your daughter likely emulates what you do. Clearly a large standing armoire is too big (and expensive) for a little girl with a small jewelry collection, however you can buy something similar that is made specifically for little girls. Below are examples of the choices that you have to give a jewelry armoire to your little girl. -Standing Jewelry Armoire in Oak Finish – This top selling smaller jewelry armoire is unique in its combination of traditional & modern design. The traditional nickel hardware with ivory suede felted lining are why this is so popular. The top lift lid has open storage as well as ring rolls, along with a large mirror. A top feature of this design are the side cabinet doors with multiple hooks & catch panels per side. Four fully lined gliding drawers & cabriolet-style legs complete this beautiful piece. -Classic Armoire – Chasing Treasure also recommends this splendid girl’s jewelry box. Traditional white with complete hand-trimmed ivory felt lining. It has antique hardware & handles for the gliding drawers with a tapered column legs. The opening top lid has a central line of ring rolls and six open compartments, four gliding drawers, a large mirror, and two necklace cabinets. So as you shop for a little girls jewelry box, keep the above in mind…not only will she have it for many years to come, she is very likely to hand it down to her daughter!